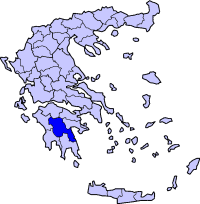 Palamari (Greek: Παλαμάρι) is a mountain village and a community in the municipal unit Trikolonoi, in Arcadia, Greece. It is located on a mountain slope north of the valley of the river Alfeios, at about 700 m elevation. It is 2 km west of Pavlia, 7 km east of Karytaina, 8 km southeast of Stemnitsa and 10 km north of Megalopoli. In 2011 Palamari had a population of 15 for the village, and 66 for the community, which includes the village Psari.